full::Generators require regular maintenance and service to make sure they are ready for emergencies. Maintenance includes testing, cleaning, oil changes and part replacement. 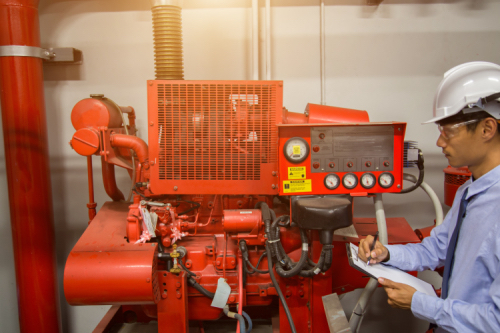 Whether your generator system is run frequently or only on a minimal basis, without properly performed maintenance it will lose value and reliability. Whether your generator system is run frequently or only on a minimal basis, without properly performed maintenance it will lose value and reliability. Professional, well planned preventive maintenance can help protect your home or business from costly repairs and make sure your generator system is ready for the next power outage. Guerrera & Sons Electric is a factory certified provider of generator maintenance and repairs for many brands of generator systems, including Kohler, GE, Briggs and Stratton, and Winco. We have over 20 years of experience in this specialized business. Below you will find descriptions of our available plans from which to choose. We are confident you will find a plan to suit your needs. Call us today for your generator maintenance plan quote! Annual Auto-Schedule Maintenance is a program where the homeowner authorizes GSE to perform annual maintenance on their standby generator system automatically, each year. This program takes the worry out of remembering when service is due and will save money as well. When maintenance anniversary date approaches, GSE will schedule the maintenance on the first date available on our calendar unless the client has indicated that they want us to do a loaded test of the transfer switch (in which case an appointment will need to be made). Automatic scheduling of annual maintenance appointment. This means you no longer have to remember to call us to schedule your appointment. You will receive notice upon scheduling. If any generator repair costs are needed, plan members receive 15% off all generator repair costs not covered under manufacturer warranty. At the completion of the service, a report covering the condition of the unit, and the services performed will be issued to the system owner via email. The agreement may be cancelled at any time after the first maintenance as long as written notice is received according to the agreement. Testing of system for faults, errors codes. Check/correct level of unit (air cooled units), inspect base condition. Reset exercise timer if requested or necessary. Get a free generator maintenance estimate today! Our most popular plan. The Semi-Annual Maintenance Plan includes the automatic scheduling and performance of 2 maintenance visits per year ( 6 month intervals). GSE will automatically schedule your maintenance (see maintenance services below for what is performed each maintenance visit) visits and provide advanced email or telephone notification. Automatic scheduling of 2 maintenance appointment each agreement year. This means you no longer have to remember to call us to schedule your appointments. You will receive notice upon scheduling. At the completion of the service, a report covering the condition of the unit, and the services performed will be issued via email (if available) to the system owner for each visit. The agreement may be cancelled at any time after the first agreement year as long as notice is received in writing via either email or letter any time prior to December 1 (to cancel for the following agreement year). The Call to Schedule Program applies to all generators that are not on the Auto-Schedule Program. As in the past, GSE will attempt to contact the system owner via phone and email as the anniversary date approaches. After the 3rd message is delivered, we will await customer response. The cost of the call to schedule maintenance program costs more than our auto schedule plans but there is no contract, you just contact us when you are ready to schedule! A portable 2000 watt portable generator will be delivered in emergency situations if a covered unit is not functioning between the hours of 7 AM until 7 PM Monday thru Friday. The portable unit will be filled with enough fuel to run 6 hours, and an additional gallon of gasoline will be delivered. Emergency loads (sump pump, medical equipment) will be connected to the portable unit. An additional 4 receptacle outlet box will be run to the kitchen area where a refrigerator or lighting may be plugged-in for the duration of the power outage (These units are not intended to run 240 volt or other heavy loads). The portable generator will be picked up when utility power has been restored.